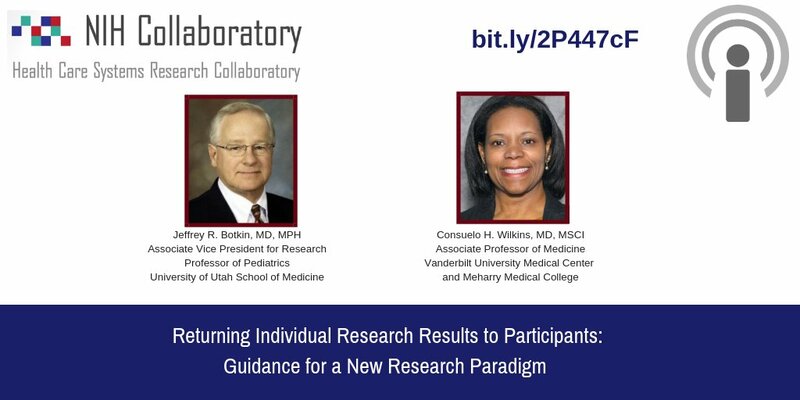 NASHVILLE, Tenn. Meharry-Vanderbilt Alliance Executive Director Consuelo H. Wilkins, MD, MSCI was featured in the October 1, 2018, episode of the NIH Collaboratory Grand Rounds podcast. In the episode, Dr. Jeffrey Botkin and Dr. Wilkins discuss returning individual research results to participants. In their conversation with Dr. Adrian Hernandez, Botkin and Wilkins emphasize the importance of returning results to participants, the present challenges and hopes for the process in the next five years. These podcasts are intended to provide extra content from Grand Rounds speakers through conversations with Collaboratory moderators about interesting and timely issues in the field of pragmatic clinical trials.